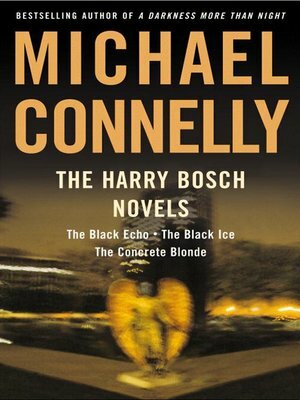 For the first time in one volume, the three novels that introduced Michael Connelly's great LAPD homicide detective, maverick Hieronymous (Harry) Bosch. The Black Echo (Winner of the Edgar Award for Best First Novel) For Harry Bosch-hero, loner, nighthawk-the body stuffed in a drainpipe off Mulholland Drive isn't just another statistic. This one is personal. Billy Meadows was a fellow Vietnam "tunnel rat," fighting the VC and the fear they used to call the Black Echo. Harry let Meadows down once. He won't do it again. The Black Ice The corpse in the hotel room seems to be that of a missing LAPD narcotics officer. Rumors abound that the cop had crossed over-selling a new drug called Black Ice. Now Harry's making some dangerous connections, leading from the cop to a string of bloody murders, and from Hollywood Boulevard's drug bazaar to Mexico's dusty back alleys. In this lethal game, Harry is likely to be the next victim. The Concrete Blonde When Harry Bosch shot and killed Norman Church, the police were convinced it marked the end of the hunt for the Dollmaker-L.A.'s most bizarre serial killer. But now Church's widow is accusing Harry of killing the wrong man-a charge that rings terrifyingly true when a new victim is discovered with the Dollmaker's macabre signature. For the second time, Harry must hunt the murderer down, before he strikes again. Together, these three novels are the perfect way to discover, or rediscover, the sleuth the New York Times Book Review called a "wonderful, old-fashioned hero who isn't afraid to walk through the flames."